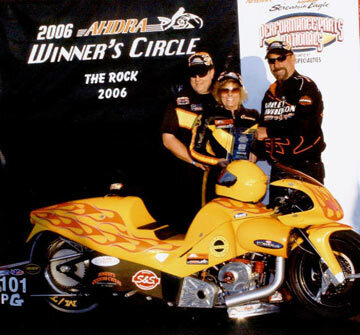 Longtime NHRA Pro Stock racer and 2006 AMDRAGS champion Connie Cohen fills us in on the recent sale of her Buell and brings us up to speed on the world of Pro Stock racing. Memorial Day has come and gone. The weather here in Connecticut was very pleasant. There were plenty of motorcycles out cruising – taking full advantage of the summer-like days, and nights. My husband Marc and I were in North Carolina for the holiday. We drove there to meet up with Matt Smith of Matt Smith Racing. I wish I could say this was a fun-filled holiday vacation, but it was not. We went there to sell our NHRA Pro Stock Buell Motorcycle to Matt Smith Racing. Selling the Buell, the best bike I’ve ever raced with, was the most difficult decision that Marc and I have had to make in order to keep C.C. Rider Racing alive. Marc built this motorcycle and is most proud of its performance. Racing the Buell, I won three Harley races out of four in 2006, and became the World Champion for the AMDRAGS Outlaw Pro Stock class for 2006. C.C. Rider Racing has been struggling financially since the beginning of the 2005 race season. We thought by building such a great motorcycle as the Buell, a new sponsor would come along and support our racing team. Even though we had success racing this bike, we have been unable to secure financial backing. By selling the Buell, which is very expensive for us to maintain, this will allow us to continue racing with our TL1000 Suzuki Pro Stock Motorcycle, which is easier for us to keep up and running until we have a sponsor. Matt Smith Racing has selected Chris Rivas, former driver for Mohegan Sun Racing, to be the driver of its newly purchased Buell. Chris is currently in the 6th spot in the NHRA Powerade points, and his first race on the Buell under Matt Smith Racing, backed by Torco Race Fuels, will be at the NHRA Torco Nationals in Chicago June 7th–10th. Matt Smith is currently number one in the points coming off with the win at the 11th annual O’Reilly NHRA Midwest Nationals presented by Castrol in Madison, Ill. (St. Louis). Mohegan Sun Racing and Guidera Racing have joined to form a new team. Vic Guidera and his sons, Matt and Len, are very pleased with the turn of events that have led to their new partnership with the Mohegan Sun team. Due to recent financial circumstances, Guidera Racing had downsized by letting go of crew chief Larry Cook. Now merging with the operation run by Mohegan Sun team co-owners Brian Bozsum and Jessey Fenton, with Rick Maney as crew chief, the Guideras are very excited for the future of this new team. Matt Guidera is sitting number 13th in points. As part of the activation of the new relationship with Guidera Racing, the Mohegan Sun NHRA promotion slated for June 19th will be held with Guidera as the Mohegan Sun-sponsored rider for all of the NHRA-themed activities at the casino. Following a review of recent performances in the Pro Stock Motorcycle category, NHRA has announced that the minimum weight for all Buell-powered motorcycles will be increased by 10 pounds, from 615 to 625 (minimum weights include the rider). The increase is part of NHRA’s ongoing efforts at maintaining competition within the category. The change is effective June 7, 2007, at the Torco Racing Fuels Route 66 NHRA Nationals at Route 66 Raceway, which is the next stop on the POWERade tour for Pro Stock Motorcycle. Harley Davidson V-Rod (160 CID) and Suzuki (101 CID) remain at 615 pounds. I’m not sure if I will make it to the Torco Racing Fuels Route 66 NHRA Nationals, but I will be in Englishtown, NJ at the NHRA Super Nationals on June 21st-24th. As I stated in my May article, self-taught artist John Guillemette is currently working on a new series of oil paintings which pays tribute to NHRA Pro Racers. I am so honored that Mr. Guillemette has selected me as the subject of his first painting in the series. The unveiling of the painting will be at Englishtown, in my racing pit, at the NHRA Super Nationals.